Citizen: An American Lyric was a finalist for the National Book Award in poetry and winner of the NAACP Image Award, the Los Angeles Times Book Prize, the PEN Open Book Award, and the National Book Critics Circle Award in poetry. It was also named one of the best books of the year by numerous media outlets, including The New Yorker, The Atlantic, National Public Radio, and Publisher's Weekly. The book lays bare moments of racism that often surface in everyday encounters. It combines poetry with commentary, visual art, quotations from artists and critics, slogans, and scripts for films. It's "an anatomy of American racism in the new millennium" (Bookforum). An initiative of the National Endowment for the Arts in partnership with Arts Midwest, the NEA Big Read broadens our understanding of our world, our communities, and ourselves through the joy of sharing a good book. For the second consecutive year, Center for Arts-Inspired Learning (CAL) has been selected as one of 79 nonprofit organizations to host a NEA Big Read program. 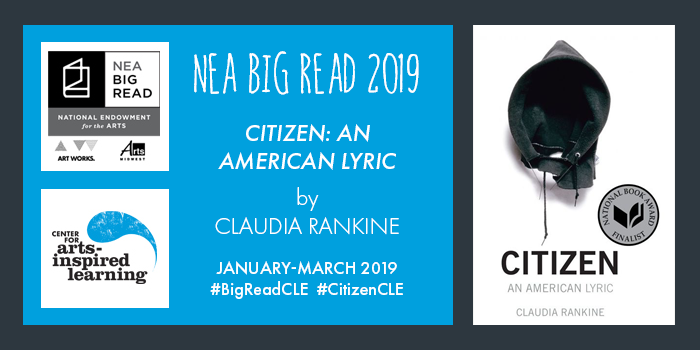 A grant award of $15,000 for the 2018-’19 program year, combined with expanded community partnerships and programming options, will give residents throughout Cuyahoga County the chance to participate in Cleveland’s NEA Big Read celebration of Claudia Rankine’s Citizen. The official announcement can be read in the press release. For more information about the NEA Big Read 2019, please visit neabigread.org. We hope you will read and celebrate Citizen: An American Lyric with us! Public programming runs from January 23 through the end of March, so check out a copy of the book from your local library today and browse our events calendar to find an event near you! SOCIALIZE WITH CLEVELAND’S NEA BIG READ 2019!